Place the chopped chocolate in a medium sized heatproof bowl. Set aside. Heat the cream and butter in a small saucepan over medium heat. Bring just to a boil. Immediately pour the boiling cream over the chocolate and allow to stand for a minute or two. Stir with a rubber spatula until smooth. (If the chocolate doesn't melt completely, place in the microwave for about 20 seconds, or over a saucepan of simmering water, just until melted.) If desired, add the liqueur. Cover and place in the refrigerator until the truffle mixture is firm (this will take several hours or overnight). Place your coatings for the truffles on a plate. Remove the truffle mixture from the refrigerator. With your hands, a small ice cream scoop, a melon baller, or a small spoon form the chocolate into round or mis-shaped bite-sized balls. Immediately roll the truffle in the coating and place on a parchment lined baking sheet or tray. Cover and place in the refrigerator until firm. 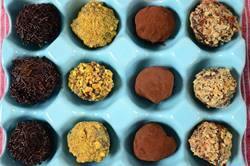 Truffles can be refrigerated for a couple of weeks or else frozen for a couple of months. Bring to room temperature before serving. To Toast Nuts: Preheat oven to 350 degrees F (177 degrees C) and bake nuts (pecans, walnuts or almonds) about 8 - 10 minutes or until brown and fragrant. For hazelnuts toast about15 minutesor until the skins start to blister. Remove from oven and roll in a clean dish towel. Let the nuts 'steam' for about 5 minutes and then remove the skins. Once the nuts have cooled, chop coarsely.